In 2004 I was offered some free distance learning courses in life coaching and so I took up the offer. I thoroughly enjoyed learning all about how life coaching changes lives, how the mechanics of coaching work, practising on various people and of course receiving my certificates to tell me that I was now a qualified life coach. So now I could go out and change the world! Not quite. In 2005 there followed some more learning with The Coaching Academy which involved an upfront cost, several weekends attending lectures (extra cost of travel and accommodation) and then loads of workbooks to complete and a dissertation to write. The workbooks were simple enough, the dissertation took time. There was very little ongoing support and I qualified as a corporate coach. So now I could go out and change the world! No. 2006 came and I decided that NLP would be useful. I undertook a three day course. This involved more upfront expense, (extra cost of travel and accommodation) interactive lectures every day and at the end of those three days I was a qualified NLP Practitioner. No support afterwards. That was it. Was I ready now to go out and change the world? No, there was still something missing. Still in 2006 I trained with Dawn Breslin who had worked in television and had a slightly different approach to coaching. Her style was gentle and worked loosely on emotions and boosted self-esteem and confidence. This involved a lot more upfront expense, 5 days of interactive lectures and I qualified as a confidence coach and group trainer. Very little ongoing support. This worked for me on several levels and I changed some people’s lives for the better, but there was still something missing. I needed more, but I wasn’t sure what. In the same year I trained with The Association for Thought Field Therapy and loved how it all worked. I am qualified in the Callahan Techniques of Thought Field Therapy. Also in the same year I trained with Healing Hands School of Natural Therapies in Indian Head Massage and qualified with a Level 3 Diploma. This has been very useful when working in festivals as I have helped many people get rid of their headaches, creaky necks from sleeping in tents, and generally relaxed them over the past twelve years. In 2007 I qualified with the School of Natural Sciences with a diploma in Sports Psychology. A great subject that works well with coaching. In 2010 I was intrigued by some information I found on Twitter about an emotion based coaching programme that offered something different. I contacted the person who was tweeting and she put me in touch with the creator of the programme. This was Maia Berens. We talked on the phone, I found out about how the programmed worked – online. I found out that there would be ongoing phone support weekly – a real person to talk to and bounce ideas off and learn from. I found out I could work with other coaches and enhance my learning on weekly calls too. So that was learning online with two calls per week to support and teach too. And allegedly there was support and contact going on long after completion of the course. There was an upfront expense and I signed up there and then. Six months later I graduated and although I was promised that teaching would continue for the rest of my life and at no extra cost, this did not happen. The person who ran the courses was really doing them for her own benefit, to stop her feeling lonely and to boost her own self-esteem. So once I had graduated I was basically shunned from the organisation and my name does not appear anywhere on the list of qualified coaches. Also in 2010 I achieved an Edexcel Level 4 BTEC Professional Award in Preparing to Teach in the Lifelong Learning Sector (PTTLS) which helps with planning and delivering workshops and training sessions. In 2011 I achieved a Diploma in Distance Tutoring from The Learning Institute and began tutoring distance learners to help them achieve the qualification of Life Coaching Diploma with the Blackford Centre. I love working with these students, who come from all different backgrounds and always work hard to achieve their aims. Also in that year I worked with Susan Jeffers, author of Feel the fear and do it anyway. I met her in London and we chatted for ages about what she does and how she liked to meet people who want to do her work. I completed all the necessary training and became accredited to deliver her courses. Susan read the manuscript of my book ‘What you believe creates your reality’ and commented “A really good book”. A great accolade indeed. Sadly Susan died in 2012. In 2015 I achieved a Cognitive Behavioural Therapy Diploma from the Centre of Excellence and have worked with some lovely clients. In 2016 I achieved a Mindfulness Diploma from the Centre of Excellence and this works really well with coaching. In the same year I achieved a Special Educational Needs & Disability Diploma (SENDS) from the Centre of Excellence which has given me a greater understanding of the needs of people with additional needs. Also in the same year I worked with Jamie Smart over a period of months, which involved several whole weekends of lectures, plus the additional expense of travel and accommodation, plus online lectures and achieved becoming a Clarity Coach using the three principles and working from the inside out. Something which works very well with my coaching skills. It is my choice to be a life coach and I am very happy with my profession. My career definitely reflects my passions and life purpose. My purpose is to help people to change their way of thinking so that they learn to love themselves and by doing that they learn to live their lives authentically as themselves. This of course has a ripple effect, as other people change their reactions and perceptions and they see a whole new person and want to change too. My major influences have been Kelvin (my husband) who supports me in all that I do, me because I believe in myself and am learning more and more how to be ME, my friends in deed (fellow coaches) and everyone who has taught me something throughout my life. I am finding it totally realistic to want to change the consciousness of the world, one person at a time. I want to impact the lives of one million people either directly or indirectly. We are all emotional beings who have been conditioned to think of others first. Yes, we must consider others in the world, but we must also look after ourselves first. If we don’t look after ourselves we cannot look after other people. I am changing the world, one thought at a time. If you would like to begin to change the world, or change your world, you like my story, then contact me and begin your journey. I would love work with you. When I was in my teens, and even up to my early 40s, I had very little self awareness. I plodded along doing what I was told to do, manipulated by so many people. I was so totally not self aware I didn’t even notice that I was living my life on other people’s terms. It is only since I began training to be a transformational coach thirteen years ago that I have really discovered myself and discovered my own self awareness. I have found that to be able to grow into my own self-awareness I have to be aware of my feelings and emotions. This was quite a difficult journey for me, as I have suppressed feelings and emotions for many years. The reason – I was conditioned by my parents from childhood that I should be seen and not heard. I was told that I should not express anger or display any emotion. And so I learned to repress them. Having this understanding now after learning so much about my feelings and emotions and rediscovering who I am really am, I know that I can express my feelings and emotions. And this is a huge step for me towards self-awareness. But what does self-awareness do for me? What are the benefits to me? Being self-aware has given me the opportunity and freedom to change those things I want to change about myself and create the life that I want. I now don’t allow others to manipulate me. I live my life on my terms. I am seen and heard and I do express my feelings and emotions. The more clarity I get about who I am and what I want, and of course why I want it, the more I empower myself to consciously make those wants a reality. But, how do I get this clarity? I turn to the expert – ME. I know more about myself than anyone else, I know I have been manipulated and by whom. I know I have suppressed my feelings and emotions, and I know why. And I have got to know myself even better over the past few years by becoming so much more self aware. I am, of course, still learning. Honesty is vital in my answers to myself. It will lead to my true self awareness, but it does take a lot of courage. It is the courage to face my fears or to face something I find difficult to accept about myself. For instance, I know that I am impatient and want things to happen now. I also know that when people are speaking to me I used to get impatient to hear the end of what they were saying, and I tended to try to finish their sentences for them. I know this about myself and now take the time to listen when people are talking and not just to give them an answer, but to hear what they are saying beyond the words. By being totally honest with myself I take ownership of my actions, beliefs, thoughts and feelings and find those beliefs that are no longer serving me. Those beliefs can then be discarded, altered or whatever feels right for me now. I find that sometimes I do slip up and give an answer that perhaps I think I should give, rather than what I really know is right. That means I am giving answers from my head rather than getting in touch with my feelings and getting the answer from inside. To get out of my head again, I take several deep breaths, allow the brain to quieten and start to listen, to notice where the thoughts are coming from. This helps me to balance myself and to find the answers I need, and they come from inside me rather than from my head. I have learned that life only works one way, from the inside out. And of course I am learning every day more and more about myself too. If you find this resonates with you, get in touch with me for a free conversation about your thoughts on self awareness. The dictionary definition is: ‘The power or right to act, speak, or think as one wants’. It also says ‘The right to follow one’s own beliefs in matters of religion and morality’. We all deserve the freedom to be who we are, which includes acting, speaking and thinking as we want, without fear of criticism, chastisement, ridicule, admonishment and anything else people can throw at us. We are all free to believe in whichever god we choose, or not to believe. We are all free to implement our own moral standards without judgement by others or of others. We are all free to determine what we will wear, whether we will wear make up or not, how we like our hair to be done etc. Without that freedom we can very easily become slaves to the views of other people and lose sight of our own identity. Come along to my workshop and find out more about how you can achieve your freedom. 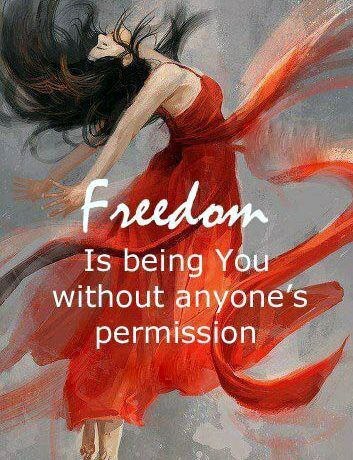 Remember, you don’t need anyone else’s permission to be you. Be proud of who you are, stand tall and don’t hide in the background – that is not where you are meant to be. In September I am presenting a FREE workshop and freedom is one of the topics included. Click here to book your ticket today and learn more about the secret of SELF.